Rainhill, on the outskirts of Liverpool, is famed in railway history for its locomotive trials in October 1829. Five engineers entered their steam engines in a competition to secure the contract to build locomotives for the Manchester to Liverpool Railway. Stephenson’s ‘Rocket’ proved its worth and won the day. 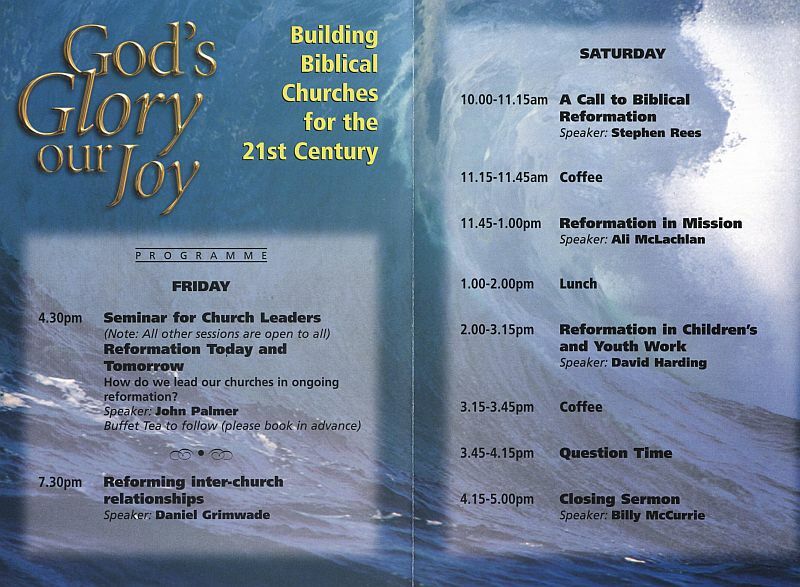 It was a test of a different kind which drew about 150 men and women from churches in the north-west and beyond to Trinity Evangelical Church, Rainhill, for the ‘God’s Glory, our joy’ conference on October 14-15 2005. 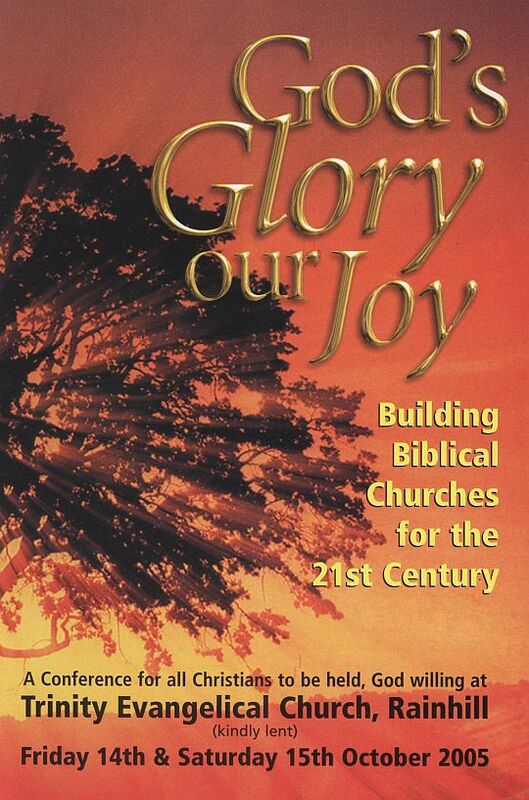 Entitled ‘Building Biblical Churches for the 21st Century’, we were challenged to test our churchmanship and our approach to mission, inter-church relationships and children’s work against Scripture. The papers given were well prepared, well delivered and saturated with Scripture. These conferences, which have been held now for several years, have certainly proved their worth in stimulating thought. First to address us was John Palmer, now based in Cardiff. He spoke practically about his experience in bringing reformation to a church. For men who might have been struggling to advance a church in reformed principles, there were some timely and wise words. Recognising what are the key and non-negotiable issues emerged as one of the important lessons to learn. Daniel Grimwade of Thornhill set out a biblical case for church unity established from the existing unity within the Godhead. The importance of recognising other churches as churches was stressed. From Scripture it was possible to see how churches co¬operated in prayer, in the support of gospel workers and in giving to those in need. Such unity makes for a strong witness to the world and has the benefit of bringing fruitfulness to those churched involved. The message covered issues such as having the correct foundations and putting up the right fences, as well as having relations of trust and friendship among pastors. There were some very helpful practical pointers as to how churches could express that unity. Stephen Rees from Stockport painted three compelling pictures of churches that had missed the ‘call to biblical reformation’. Two had opted for an unbiblical status quo while one was in the process of reinventing itself every so often to be attractive to unbelievers. We were reminded of the need to be committed to biblical reformation in all areas such as preaching, worship, leadership, discipline and care for the elderly. Costly, slow and painful the whole process will be, but it may be blessed beyond all expectation. Ali McLachlan, of Belvidere Road Baptist Church in Liverpool, turned our attention to the subject of reformation in mission. This was very thought-provoking and drew upon personal experience serving the Lord overseas. With the Book of Acts open before us, we were given an overview of mission which involved every member and was conducted always with a view to planting a church complete with eldership. The history of the missionary movement was sketched out and we were then challenged to compare today’s situation with the method shown in Scripture. We realised that the situation where the church, rather than the individual, recognises the call to serve in mission, is becoming increasingly rare and that many who are going have not been sent. It was a challenge to hear that former generations ‘sent their best’ to the mission field. Similarly we were exhorted not to be satisfied with ‘lowest-common-denominator’ churches on the mission field that did not match up to the expectations of what a church should be from the book of Acts. David Harding from Milnrow led us in our thinking on reformation in children’s work. He outlined the nature of the problem facing many churches in building a Sunday School work today. The solution lies at hand in the Scriptures which, possessing inerrancy, sufficiency and perspicuity, have the power to teach a child (2 Timothy 3:15). We were advised from Scripture to give focus firstly to our own families and to train our children in the things of God. Secondly we should give consideration to reaching out to parents as a biblical strategy to reach the household (Acts 16:31). Again it was biblical, stimulating and gave plenty of practical help. The conference closed with a timely reminder from Billy McCurrie of Ormskirk, in the light of all that had been heard, to be doers, not merely hearers of the Word.